"Texans made me the nominee, and that's a cry from Texas for a change," says Valdez, the daughter of migrant workers who is challenging Gov. Greg Abbott. DALLAS — Lupe Valdez, the Texas Democratic nominee for governor, sits at a back table in Jonathon’s Diner, which has opened on a Tuesday, a day it would usually be closed, just so Valdez could conduct media interviews. It's far cry from the time Valdez's family, while traveling from Michigan to San Antonio, rolled up to a Dallas restaurant and at first were refused service. 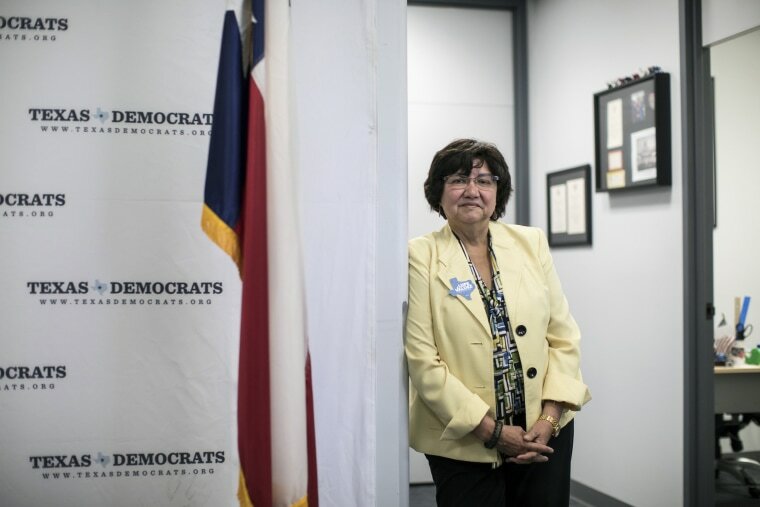 As Valdez told fellow Texas Democrats at their convention last month, her father showed he had money and was then told they could enter through the back door. Her father turned the offer down. Instead, he bought bread, baloney and mayonnaise for sandwiches so his family could eat, Valdez said. To cheers at the convention, her voice cracking, she said, "In 2004, as the underdog, Hispanic, female, lesbian Democrat, I was elected the sheriff of the same town that turned us away." Uphill battles are the framework for much of Valdez's life and the common ground she feels she shares with more Texans than Gov. Greg Abbott, a Republican who is seeking his second term. "I should be governor because the majority of Texas is the common, everyday working folk," Valdez told NBC News. "Yes, there are well-to-do people in Texas (but) that’s a small percentage and our government seems to be governing to that percentage." To many, Valdez has taken on a herculean challenge, considering the state hasn't elected a Democrat to statewide office in nearly half a century and has never had a Latino or Latina as its governor. "It is very difficult. If it were easy, you would have seen a whole bunch" of other candidates in the race, said Leticia Van de Putte, a former Democrat state senator who ran for lieutenant governor in 2014 with then-gubernatorial candidate Wendy Davis. Though the two women garnered lots of local and national attention, they lost. Her advice to Lupe was to remain authentic. People are craving genuineness, she said. Abbott brings his own uphill battles to the table as well as a Latina wife and family. The governor has used a wheelchair since he was left partially paralyzed when a tree limb fell on him at age 26. In the money race, Abbott is leagues ahead. Valdez reported she has $220,000 for her campaign, while Abbott has $29 million in cash on hand. Texas, because it is so large and has so many media markets, is an expensive place to wage a state campaign. "Lupe's story is compelling ... She was a trailblazer, but the financial odds ... it's going to take a lot of people and effort, and they've got to have the resources to get out that message," said Van de Putte. Valdez had some stumbles on her way to the nomination. She failed to win the endorsement of Jolt, a group trying to mobilize young Latino voters. They didn't like her answer when a group member asked her to explain her policy as Dallas County sheriff on holding immigrants for federal immigration enforcement officers. Valdez later apologized for what she said was an inadequate response. Separately, she left The Dallas Morning News editorial board skeptical about her ability to lead the state. Valdez has countered that she ran the seventh-largest sheriff's department in the country, about 2,700 to 2,800 employees with a budget of $140 million to $153 million over 13 years. Despite the falters, Valdez defeated Andrew White, a businessman and son of former Gov. Mark White in the May Democratic runoff. Now, she's hoping for an upset. "What the U.S. sees is not really Texas," she said. "Texans made me the nominee, and that's a cry from Texas for a change, for a change that all of us can be heard — Latinos, LGBTQ, Anglos, Muslims, African-Americans. We all need to be heard." The last time a Democrat won was .... 1994? The sobering reality is that Texas Democrats haven't won a statewide elected office since 1994 — the year the now classic movie "Forrest Gump" was released and Amazon was founded. It's been so long since a Democrat won a state office that when Rep. Joaquín Castro pronounced Texas had gone the longest of all states without electing a Democrat statewide, PolitiFact did a check to confirm the statement. Democrats' voter turnout was higher in the March primary than it's been since 1994, but in the end, more Republicans showed up at the polls. Can David Garcia catch the blue wave to become Arizona's next governor? “Any Democrat in Texas is going to have a really tough battle,” said Victoria DeFrancesco Soto, a political scientist with the LBJ School of Public Affairs at the University of Texas at Austin. “That doesn’t mean she (Valdez) can’t be a good office holder, but it hurts." But there are reasons to hope. Democrats' excitement over the highly competitive U.S. Senate race where Rep. Beto O’Rourke is making Ted Cruz, the Republican incumbent, nervous may boost turnout for other Democrat candidates. As potentially the first Latina and first openly gay governor, Valdez is generating some measured optimism that she could create her own excitement, particularly among the 5 million Latinos eligible to vote, as well as Texas women and the LGBTQ community. That excitement rests, in part, on the pile of Valdez's against-the-odds achievements. "She's lived a life that reflects the experience of so many Texans and has the values that are important to so many of the state's families," said Julián Castro, the former San Antonio mayor who is eyeing a 2020 presidential bid. Valdez is a native-born Texan who was told in school she was a second-class citizen for speaking Spanish, but who still volunteered three times for duty in Vietnam even though the military didn’t allow women in combat at the time. She later joined and rose to rank of Army captain. As a young student she pushed her parents to allow her to attend a high school farther from home because her Mexican-American neighborhood school didn't offer college prep courses. As an underfunded, underdog candidate for Dallas County sheriff in 2004, she surprised everyone, including her family, by defeating the favored Republican. She was re-elected three times. A University of Texas/Texas Tribune poll conducted from June 8 to June 17 showed Abbott with support from 44 percent of those polled to Valdez's 32 percent. Twenty percent chose "someone else" or said they hadn't decided. Focusing on "what is deserving to Texans"
Valdez is focusing on economics. Although Texas has fared well economically under Republican administrations, she said that bounty hasn't been shared by all. She stresses that one in seven Texans do not have health insurance; Texas did not expand Medicaid as allowed under the Affordable Care Act, also known as Obamacare. On education, she is promoting free community college education with apprenticeship programs. "I keep hearing all over the place: "You don't have a chance. He's got $40 million,'" she said. "You know this election is not going to be bought. This election is going to be fought. We are going to fight to get what is deserving to Texans." Valdez's elections as Dallas County sheriff came amid demographic change in the county. Texas already is a majority-minority state, but its Latino population continues to grow. About 41 percent of Texas Latinos who are eligible to vote is between 18 to 33 so they are increasingly seen as a key voting bloc — if they are energized to vote. President Donald Trump's immigration crackdown and Abbott's hard-line stance on immigration enforcement has helped drive up young Latino activism in the state. Cristina Tzintzún, executive director of Jolt, the young Latino group that spurned Valdez in the primary, said Jolt members want to defeat Abbott, but "Lupe has a real challenge to make sure she can be the candidate who represents Latinos, not just through identity, but through real policies that are needed to change Texas." Valdez and Abbott have tangled over what role local law enforcement should play in enforcing federal immigration law and over the state's immigration policing law, known as SB4. While that hasn't drummed up a lot of buzz for the governor's race, the Trump administration's forced separation of children from their parents and guardians — which has largely taken place on the Texas-Mexico border — could. "Abbott’s racist and anti-immigrant policies like the 'show-me-your-papers' legislation (SB4) got us here by cultivating an extreme culture of hate and intolerance," Valdez said. Matt Mackowiak, the Travis County Republican Party chairman, said the family separations issue won't be much of a factor in the governor's race since it's not Abbott's position. Abbott got 44 percent of the Latino vote in the last election, so the prospect of the first Latino as a governor may not give Valdez as much of a leg up as some might think. But there are some young Latinos, such as Michelle Espinal, 28, an officer with the Dallas County Young Democrats who is of Dominican descent, who respond to Valdez's narrative. Her "story of coming from nothing and really working hard and becoming someone of influence and really being truly successful in her career is really close to my heart," Espinal said. "Not only is it universal as the American Dream but especially for Latinos. It is our story." Valdez has said she's bracing for attacks during the campaign because she is openly gay, which she said is as much a part of her as being in law enforcement. "The military and law enforcement give me discipline, give me goals to achieve. They give me the standard of not perfection, but of organization and getting it done, whatever the job is," said Valdez. "The Latina and the LGBTQ give me the heart." That appeals to Luis Quintanilla, 27, who is originally from El Salvador and has temporary protected status. As a gay man, he sees Valdez as a role model. He can't vote for her, but said he will try to influence others to support her. Alex Meléndez, 22, who became a citizen two months ago and immigrated from Honduras, said he connects with Valdez even though she was criticized for her immigration record. "Immigration is not the only thing we vote about," Meléndez said. "We care about education. We care about our health care. We care about a good economy, good-paying jobs in Texas. We care about a lot of things, (even) small things like traffic."